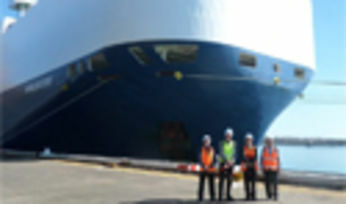 The National Group recently welcomed the first roll-on roll-off (RORO) vessel at the port of Mackay. 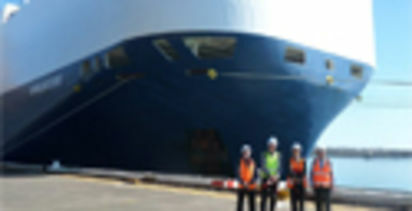 The National Group recently welcomed the first roll-on roll-off (RORO) vessel at the port of Mackay, QLD. The vessel named ‘Viking Destiny', arrived at 10am Thursday 23rd August 2018 and was greeted by a welcoming reception from Darren Fursman, Trade Development Manager of North Queensland Bulk Ports, various media representatives and captivated locals. The port of Mackay is near the mining hotspot of the Bowen Basin and with the first RORO vessel now operating in this region, will give Mackay a well needed economic boost. The vessel measuring 199m long by 32m wide, now provides a direct route to the north of Queensland, making the port of Mackay an attractive location to ship large plant and equipment in and out of Australia. The first shipment to arrive on this RORO vessel included National Group's four ultra-class CAT 794 Dump Trucks and a T282 Liebherr Dump Truck Chassis. The 794 trucks were shipped into Australia by Hastings Deering and began their journey in the United States, where they were loaded in both Jackonsville, Florida and Freeport, Texas. From there, they travelled via the Panama Canal and New Zealand, before arriving in north Queensland. This large heavy mining equipment was en-route to National Mining Services at the Bowen Basin and was being transported by National Heavy Haulage, both subsidiary companies of the National Group. Mark Ackroyd, CEO and Managing Director of the National Group noted that "this is the first time a vessel of this kind has operated in and out of the Mackay port, which is a huge milestone and a turning point for the region and the mining and construction sector as a whole". "I would firstly like to thank North Queensland Bulk Ports for their efforts, without their support this important initiative would not have been possible. The roll-on roll-off vessel is a game changer as it will create opportunities in the region for locals, employees within the mining, construction and transport industries and will help put the port of Mackay on the international map" said Mark Ackroyd. North Queensland Bulk Ports Acting Chief Executive Officer Brendan Webb, said the shipment marked a significant achievement for the port. "Trade growth and diversification are an important focus for the Port of Mackay. Our new infrastructure upgrades allow RORO vessels to berth, which significantly expands our capabilities," Mr Webb said. "These vessels make it easier to ship additional heavy vehicles and machinery into the port. More than 100,000 tonnes of break bulk cargo passed through the Port of Mackay in 2017-18 and we aim to continue this strong trend in the year ahead." Hastings' General Manager Mining Sales Jason Smith, said the delivery represented an important change in the heavy logistics supply chain traditionally employed for such cargoes. "Historically, this kind of machinery has had to be brought into Australia via other ports and transported large distances on the roads," Mr Smith said. "With mining activity picking up in the Bowen Basin, it's great to have the option to bring equipment directly into the Port of Mackay." The National Group comprises of leading companies from the mining, resource, logistics and personnel industries. Servicing some of the biggest names in mining and with an excellent record, the National Group has built a reputation as being ‘unstoppable' in heavy earthmoving equipment, provides end-to-end production mining services and heavy haulage transportation. For more information go to www.national-group.co.